Uniting the supernatural spirits and Christmas message of Charles Dickens’ A Christmas Carol with the characters and humor of Jane Austen, Barbara Tiller Cole presents a Christmas novella that is the perfect companion for a chilly night in front of the fire! Darcy made an excellent, albeit more brooding and romantic Scrooge, and I greatly enjoyed seeing everything from his perspective. 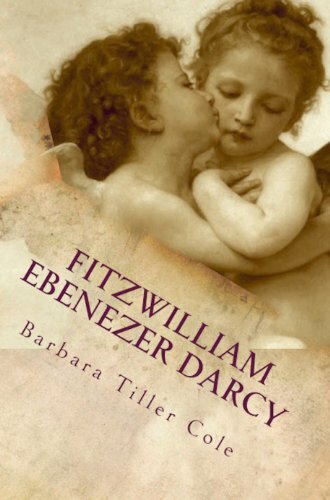 It was heartrending to see Darcy tortured by the visions of his past and terrified of how bleak the future could be for his loved ones. 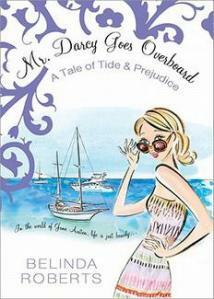 Mr. Darcy Goes Overboard, originally published as Prawn and Prejudice in 2009, is a diverting seaside retelling of Jane Austen’s Pride and Prejudice. This contemporary novel takes place in the British seaside town of Salcombe, and instead of carriages, balls and the militia, this tale is about boats, swimming, and lifeguards. Every summer, it is a tradition for the Bennet family holiday in Salcombe where there are many aquatic and tourist attractions. This year, with two young and eligible bachelors vacationing nearby and a pack of brawny lifeguards in the vicinity, this Bennet family holiday promises to be the most exciting, romantic, and surprising holiday ever! The premise of this Pride and Prejudice retelling is very cute, and the setting of a seaside town makes this book ideal for summertime reading! I enjoyed how, instead of assemblies, dinner parties, and balls, the characters came together for barbecues, estuary swims, sand castle contests, and other town events. My favorite was the estuary swim (ball at Netherfield), where Mr. Collins, instead of being a deplorable dancer, was a shockingly bad swimmer! Dear readers, leaving the comfortable realm of amiable and serene Austenesque novels, I have decided to take a brief sojourn into the terrifying, and sometimes violent, world of Jane Austen monster mash-ups. Having read and exceedingly enjoyed other Jane Austen paranormal creations (Jane Bites Back, Bespelling Jane Austen, and Jane and the Damned), I felt ready to jump into a true monster mash-up (I did read Emma and the Vampires, but didn’t really find it to be much of a mash-up). And after reading a three chapter excerpt of Northanger Abbey Angels and Dragons on Vera Nazarian’s website, I became enchanted with her tale of angels, dragons, and temperature-changing nephilim. , we learn that our heroine, Catherine Morland, possesses great metaphysical powers that enable her to see, hear, and talk to angels. In addition, we discover that John and Isabella Thorpe are strange nephilim creatures that inspire the whole town of Bath to search for secret hidden treasure. The clues of which they claim could be found encrypted in Mrs. Radcliffe’s novels. Add to that mysterious dragons flying in the sky and ghosts dwelling in furniture and you have a supernaturally twisted version of Northanger Abbey that’s quite diverting. What an amusing and charming monster mash-up! 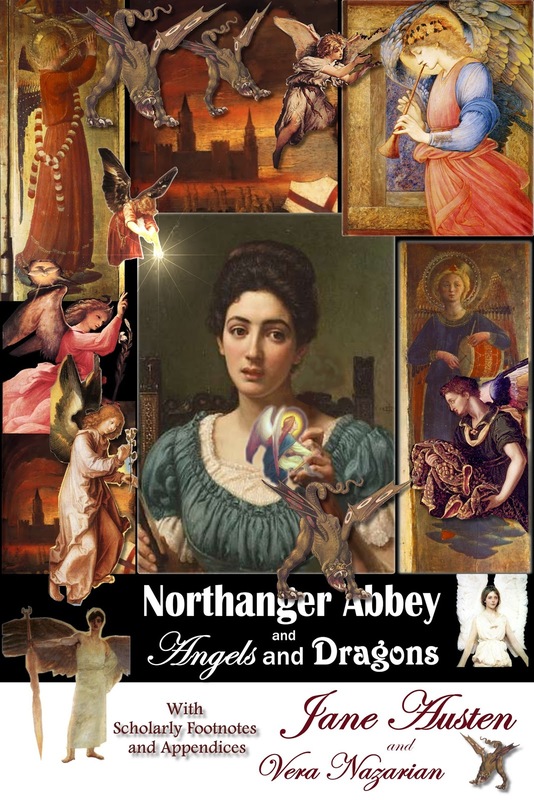 I found Northanger Abbey Angels and Dragons to be a reverent and well-crafted homage to Jane Austen’s original. I loved Catherine’s little hosts of angels; the poor dears had the difficult task of trying to keep Catherine out of danger. In addition, I found it hilarious that the odious John Thorpe was akin to a repulsive ogre that rattles about hidden treasures and encrypted clues all the time. Moreover, I thought it quite apropos that his sister, Isabella Thorpe, is a nephilim with a truly cold heart, that chills everyone that comes within her vicinity. And what about Henry Tileny, you say? What type of supernatural creature is he? What metaphysical powers does he have??? I’m afraid I can’t disclose that here, if you really want to know, you must read Northanger Abbey Angels and Dragons to find out! As you can see this is more of a mash-up of comedy and absurdity rather than violence and mayhem. Ms. Nazarian pokes fun at Northanger Abbey, her readers, and her own novel. By just reading the back cover of this book, readers can see evidence of Ms. Nazarian’s subtle sense of humor and playful tone. Besides making you laugh, this tale will warm your heart. The ending is beautifully and surprisingly romantic.